Caroline Myss has found that when people don’t understand their purpose in life the result can be depression, anxiety, fatigue, and eventually physical illness. Myss examines the lives of the spiritual masters, Abraham, Jesus, Buddha, and Muhammad, and explains how you can identify your particular spiritual energies, or archetypes—the gatekeepers of your higher purpose. 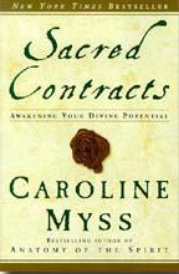 Sacred Contracts is a bold, powerful work of spiritual wisdom. Your most intriguing challenge in life is to recognize your spiritual commitments and live them to the fullest.